The Dubai Opera is located at Sheikh Mohammed bin Rashid Boulevard, Dubai, United Arab Emirates 8229; visit their website. 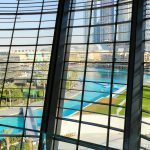 Watch the 3:22 Dubai Opera Garden Green Roof & Greenwalls – Project of the Week 3/5/18 video from Greenroofs.com on the greenroofsTV channel on YouTube. Greenroofs.com Project of the Week 3/5/18 video credits: Video courtesy of Linda S. Velazquez and photos Copyright courtesy of Knauf Insulation/Urbanscape Green Roof, Dubai Opera, EMAAR Properties, dubaimetro.eu, AntonGots.com, and Linda S. Velazquez. See the project profiles from ATKINS and NMLE. 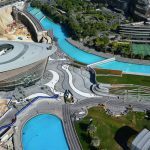 Read the November 30, 2017 High note: Dubai Opera’s Jasper Hope by Neil Halligan in Arabian Business; September 12, 2017 Urbanscape has set-up first new low weight Semi-intensive green roof in Dubai Press Release; and the August 31, 2016 The human touch by Janus Rostock of ATKINS. Learn more about Urbanscape Green Solutions / Knauf Insulation in The Greenroof & Greenwall Directory. Opened in 2016 in Downtown Dubai and situated in what is considered ‘the most prestigious square kilometre in the world’, the spectacular Dubai Opera is framed by large lakes, fountains, and an array of mixed-use development. “The Dubai Opera is the radiant centre of culture and arts in Dubai and the shining pearl of The Opera District. The iconic dhow-shaped building of Dubai Opera is a masterpiece of contemporary design, and a stylish tribute to Dubai’s maritime history. “The building’s exquisite design, by architect Janus Rostock, gives the exceptional ability to transform into three modes; from a theatre into a concert hall, and into a ‘flat floor’ mode becoming a banquet or event hall. 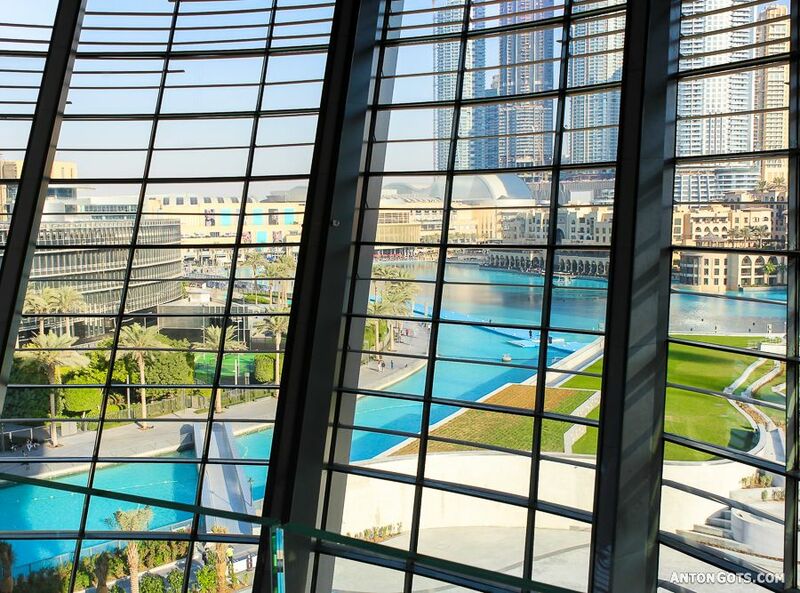 With its unique 2,000-seat multi-format theatre, Dubai Opera is a definitive international destination for performing arts and world-class entertainment productions,” (Dubai Opera). 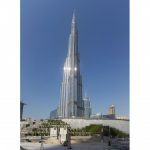 The venue also offers a rooftop restaurant and sky garden with stunning views of the Burj Khalifa – the world’s tallest building – and the Dubai Fountain. The centrally located Dubai Opera District is one of the most popular areas in the city where people tend to spend leisure time. 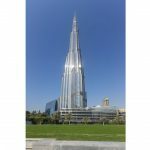 Said to contain the most expensive real estate in the world, it boasts several important points of interest: The new Dubai Opera, the Burj Khalifa, the famous Dubai Music Fountain, and the Dubai Mall – the world’s largest – not far away. 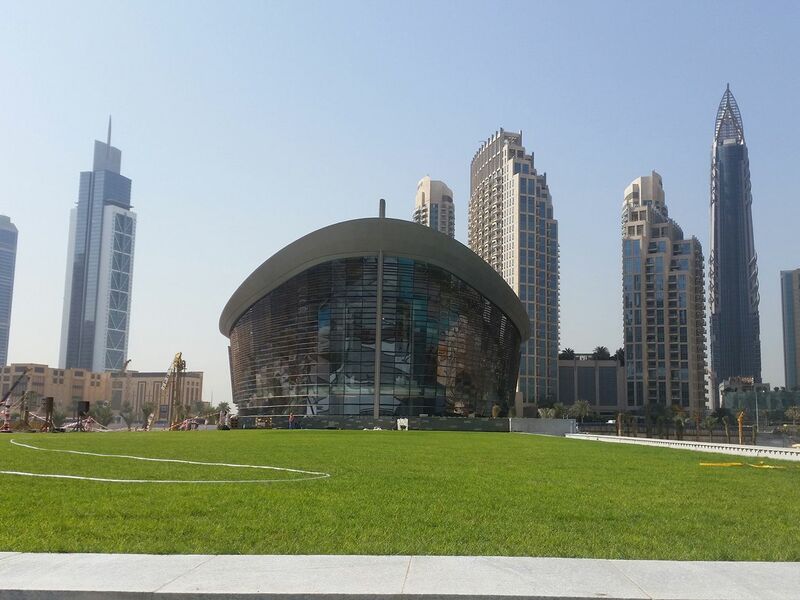 Located directly in front of the Dubai Opera and adjacent to Burj Park is the large greenroof garden park where many festivities are held. 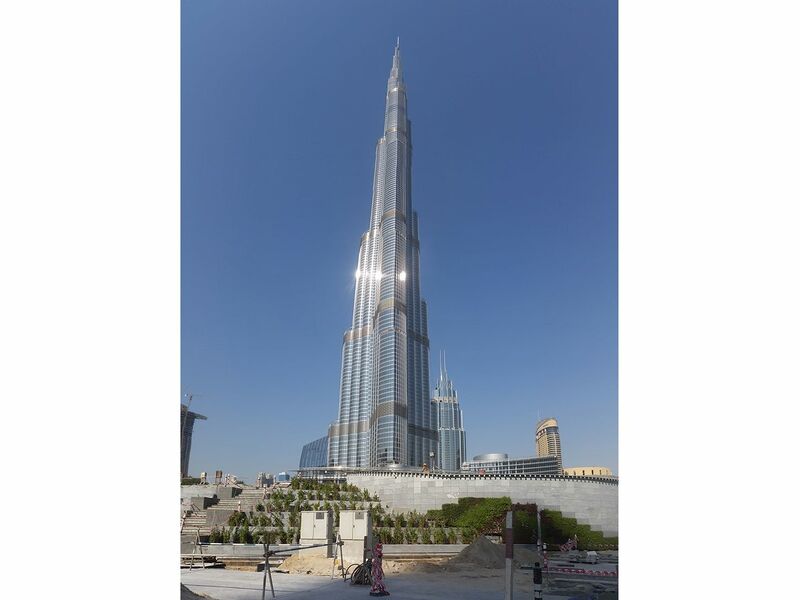 In particular, it is the main point from where the amazing Burj Khalifa’s New Year’s fireworks can be seen. Prior to the construction of the garden park, the area had one visually unattractive area – a large utility building which was just a regular concrete gray building cubical. 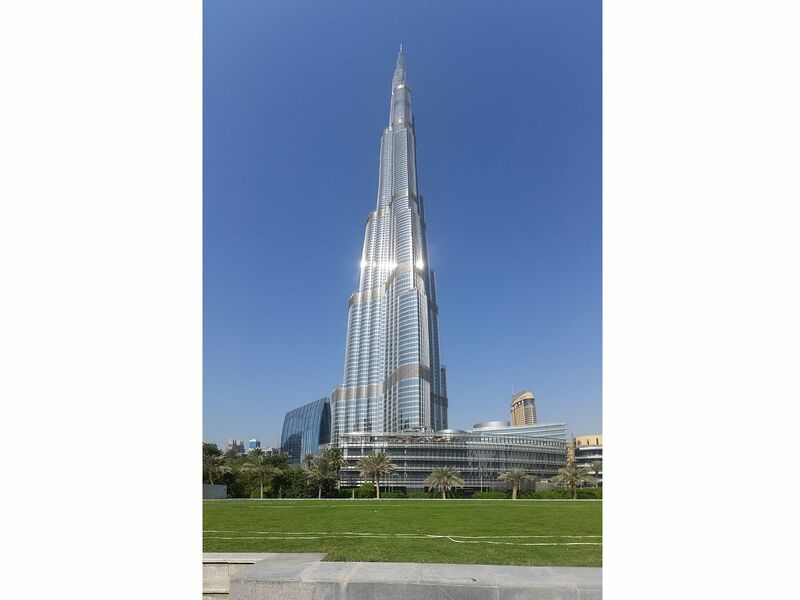 The rulers of Dubai wanted to have this area reimagined into a visually appealing space and comparative aesthetically to its beautiful surroundings. Initially, a semi-intensive green roof had been considered but was an issue with the loading weight. 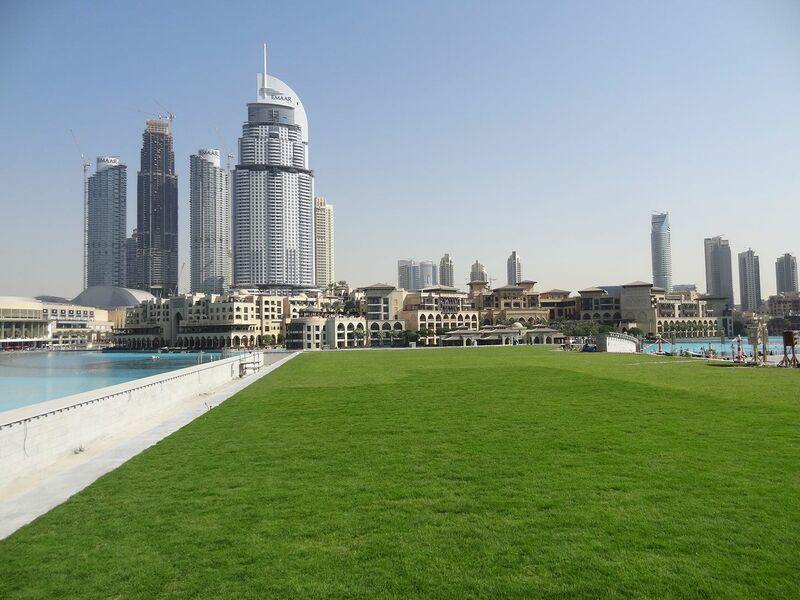 Generally, green roofs in the UAE are built with a depth of 30 – 50 cm (12 to 20″), so this option was not initially possible. Knauf Insulation proposed a solution which would lower the weight of the green roof, but at the same time improve the survival rate of the plants and lower irrigation requirements. Their proposal consisted of using one layer of Urbanscape Green Roll mineral growing media (known as Hydro Blanket in the U.S.) and a layer of local sweet soil on top with a total thickness of less than 15 cm (less than 6″). After two years of intensive testing and green roof system modification by Knauf Insulation, a lightweight system was created using only a 10 cm growing media profile. Two types of semi-intensive green roofs were installed: the large, open green park space and a smaller slightly elevated roof for plant testing. 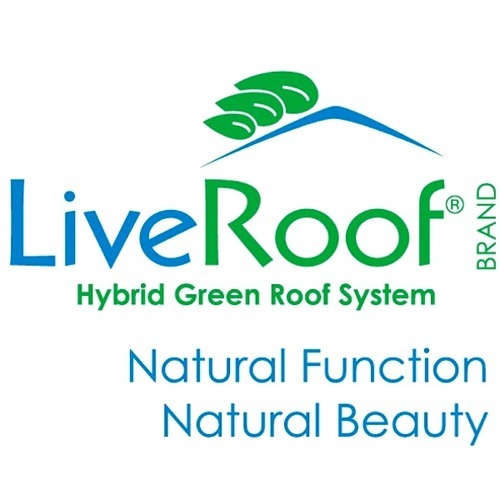 Native Paspalum Grass was planted on one roof and Sesuvium plants on the other. Drip irrigation was installed on top of the Green Roll and below the soil. The plant survival rate here in the harsh desert climate mainly due to the use of mineral growing media which holds more water and makes it easier to be available for plant uptake. 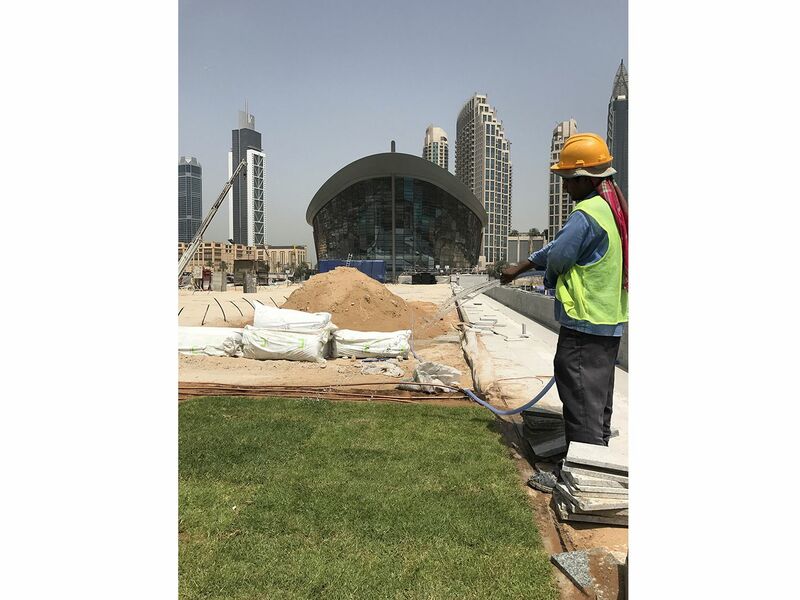 In effect, the system weight was reduced by 70% and at the same time the irrigation needs were lowered up to 40% as compared to the standard green roof solution here in Dubai. A build up access of steps was created at the center of the park for the new green roof, with access ramps on the side. 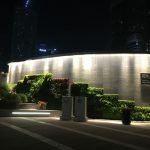 Surrounded on either side with a set of curvaceous vegetated terraces, they are dramatically lighted at night. A variety of different climate-adapted shrubs were planted such as zoysia grass, Ruellia, Adenium, Agave, and Bougainvillea in a mixture of sweet soil and mineral wool growing media. 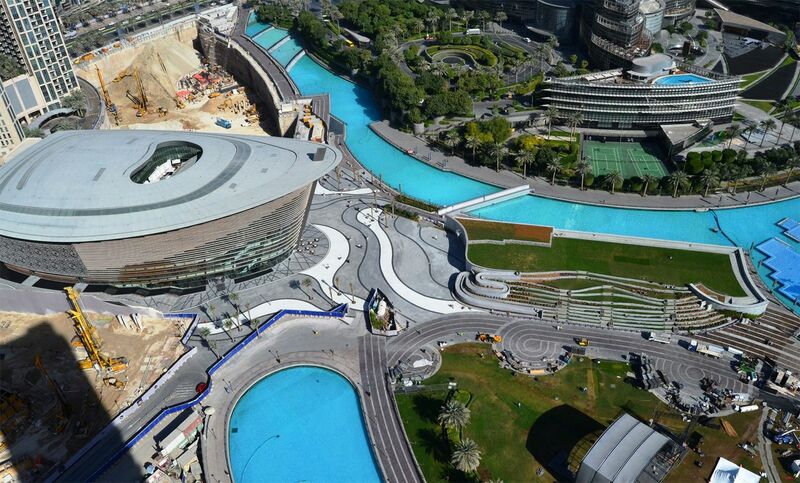 “The landscape design surrounding the building is vast and extent, covering nearly 20,000m2. 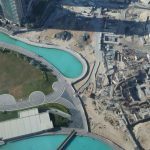 The concept was designed by EDSA and NLME was asked by Mirage Leisure Development to be the local consultant and supervise the execution of the works. 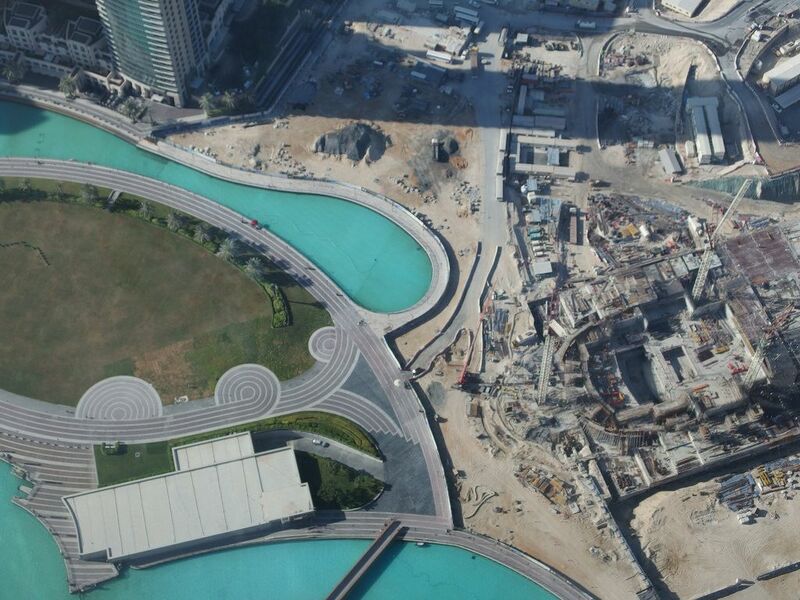 Most challenging part of the project were the curvilinear paving works and the green roof and wall installed on the structure adjacent to the Opera House building,” (NLME). 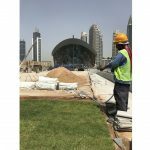 A series of approxinately 500 sf of colorful modular greenwalls were added to two sides of the green roof park to soften the structure and provide multiple flowering and textural experiences for the visitors to the Dubai Opera Garden. Dubai Opera received the Design of the Year (Identity Design Awards 2016) and GCC Project of the Year (MEP Middle East Awards 2015). 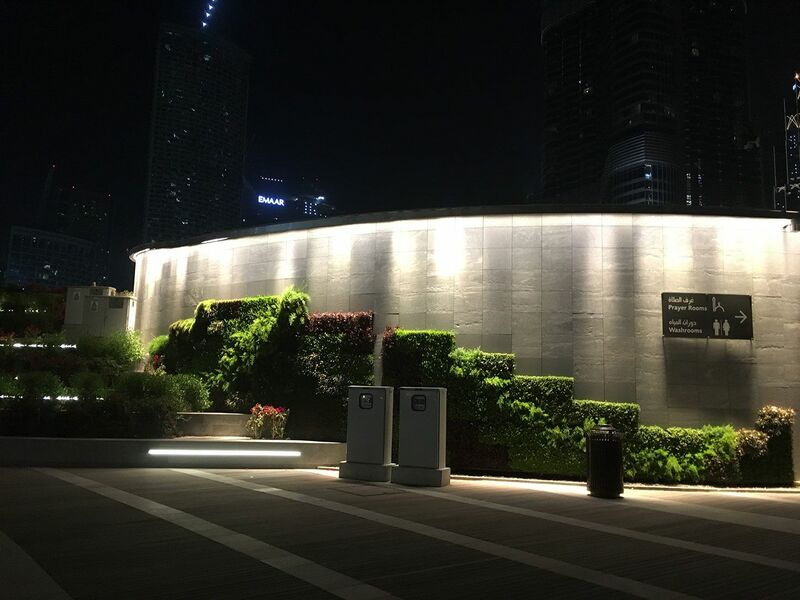 See the Dubai Opera Garden Greenwalls Project Profile in The Greenroof & Greenwall Projects Database.